This provocative Nast cartoon presents Horace Greeley as dupe of the Liberal Republicans, especially of his former assistant, Whitelaw Reid. A sub-head underneath the caption quotes a February 1871 issue of the New York Tribune, which identifies former Confederates as the dominant force in the national Democratic party. 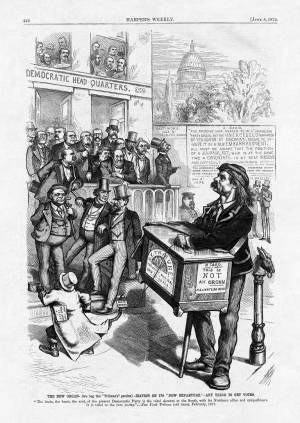 Nast's use of Greeley's own words against him was a powerful shot across the bow of the whole anti-Grant movement, intended to alienate regular Democrats who were preparing to adopt Greeley as their candidate during their national convention at Baltimore on July 9-10. It was also meant to underscore allegations that intransigent Southern Democrats were in control of the Liberal Republican coalition.